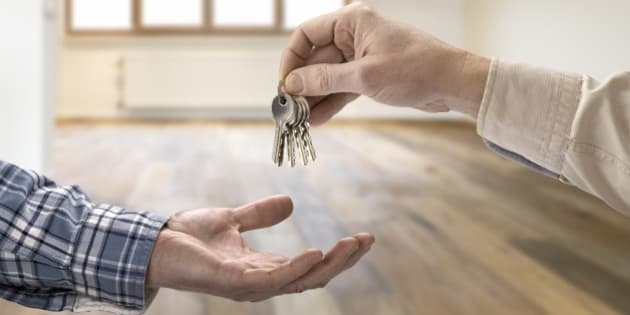 Realtor giving house key to buyer in empty room. It's a difficult, confusing and often frustrating process trying to decide whether to buy or to rent. For most consumers, purchasing a home is the largest investment of their lifetime. Not a choice to be taken lightly, lots of research and planning are imperative to ensure you come to the right conclusion and avoid feeling like you're living out a financial Shakespearean tragedy. Before you start crunching numbers to figure out exactly how much you can afford to spend, the team at Canada's leading apartment finder and real estate marketing website RentSeeker.ca came up with a list of considerations to help with your decision, including financial and emotional factors. Think of these points as general elements in a big-picture concept that should be considered along with careful financial planning when trying to figure out whether renting or buying is the better option for you. Before getting into the nitty-gritty world of finance and real estate investment opportunities, it's very important to consider your goals. Are you looking for a place to live or an investment opportunity? There is no shortage of stories about people making money in the real estate market. Whether you heard about your friend's friend who sold their house for thousands over asking or others who received offers they couldn't refuse, be careful when trying to make your home an investment. It's not as easy as you think, especially in big-market cities. Despite the risks and constant threat of a crash, no one can deny that there is money to be made in real estate. There are numerous TV shows and seminars that make it sound simple, but the facts are that it is anything but. The Canada Mortgage and Housing Corporation (CMHC) recently stated that real estate markets in the top cities to live in Canada are currently overvalued. In October of 2015 their Housing Market Assessment (HMA) listed Toronto, Vancouver, Montreal and Edmonton as examples of cities where buying a home can be very risky. Foreign ownership, overvaluation and overbuilding of rental properties like condominiums and apartments won't help buyers sleep soundly at night, and a cruise down the Gardiner in Toronto offers no shortage of sprawling green glass buildings filled with renters. There is no shortage of articles by real estate experts and economists predicting a "housing bubble" and when it will all crash. Whether you personally agree or not, renting allows you to focus your investments on opportunities away from the housing market, offering you freedom and liquidity of your assets. If you are new to the real estate market, but want to live in these popular cities, renting for a couple years may be the more responsible choice. Such a choice can provide time to get more insight into how the economy and the real estate markets continue to progress. Don't think about how much money you could be making down the road -- use your current financial position as a baseline for the future. It's much easier to upgrade than to downgrade, and biting off more than you can chew with a purchase can critically damage your bank account. Make a budget of what you can afford to spend on a monthly basis for housing costs and stick to it. Check out this comprehensive housing affordability calculator for a thorough breakdown of the numbers in the rent v. buying debate. For many, it depends on the amount of money you currently have and your access to loans and mortgages. Buying a home includes all sorts of expenses that you may not consider. Closing costs such as legal fees, land transfer taxes and unexpected repairs can end up costing tens of thousands of dollars on top of your purchase. You'll be lucky to avoid some unexpected repairs in your first year -- no matter how experienced your home inspector may be. The bottom line is if your monthly allowance on housing doesn't have a few hundred dollars to spare, play it safe and rent. If you're not the type who has done residential repair work or happens to be a tradesperson, maintenance expenses can be much greater than doing the work yourself, and you never make money on repairs. There are tons of investment opportunities that can produce higher yields that real estate, so unless you plan on doing the majority of the work yourself, buying and flipping properties can be just as big of a gamble as the roulette wheel. If you're not specifically looking for an investment opportunity, renting can offer some great benefits to help you live a happier life. You don't have to worry about the real estate market, and for many people out there, that benefit is all they need. The flexibility of not being house poor allows for more vacations and arguably less stress. There isn't a single person who thinks that moving is fun, but being able to live where you like and change the scenery every couple of years can offer a fresh outlook on the city you live in. Of all the emotional factors to consider, honesty, like any relationship, is the most important. In this case, you have to be honest with yourself when accessing your needs v. wants. Focus on the reality of your current financial position and not what you think your income can or will be down the road. It's easy to think you can afford that dream home with a pool or that hip downtown condo without realizing all of the associated costs with home ownership. There difference between wants and needs can cost you thousands and put you in a compromising position if you bite off more than you can chew. If you are currently living with a partner or plan to for the first time, have a truly honest conversation about priorities matter the most. Location? Size? Interior finishes? This discussion may yield unexpected responses. There are many benefits to renting, and many for purchasing a home. The real decision is unique to each individual's circumstance and financial position. With the amount of information and tools available on the web today, the best advice we have is to do lots of research, and make the wise financial decision that works for YOU!